Angelica “Angie” Parker earned the right to be bitter when she walked into a conference room and found her husband of twenty plus years on top of a twenty-something girl. Not in the mood to believe that she’d seen what she saw, Angie immediately decides that it’s high time to take care of the house in a small town in the Rockies she inherited from her estranged aunt a while back. When she gets there, her cute neighbor Louise hands her the keys to the property and, followed by the strange chirping sound from a tree outside, Angie walks inside to /try to/ ignore the nightmare that is her life, and face her poop-colored house. I know from personal experience how hard it can be to start over in your life. I could identify with a lot of the way that Angie feels while she’s navigating from the world she’d always thought she’d known, into new territory. There’s a sense of loss, of not really knowing what your role is. And to top it all off, she’s having to do this while trying desperately to hold it all together in order to still be the best person, the best parent, she can be. It’s never easy, and it’s ultimately a wild roller coaster ride, but it’s well worth it to experience it and see it through Angie’s eyes. From the get go, when she finds her husband in a very uncompromising position, to the point where she’s realizing in order to move forward, she’ll have to let go- it’s all told from a very realistic perspective. There are even moments where she’s feeling left out when it comes to her new neighbors, the ones who appear to have the perfect marriages and families, while her marriage and family is falling apart. It felt so true to how someone jilted would feel, that even though they can appreciate someone else’s happiness, it still feels bittersweet. There are many more untruths that are discovered for Angie, the kind that cause irreparable damage, the kind that there is no coming back from. Ultimately, it’s in moments like that where we find out how much strength and perseverance we’ve got hidden inside ourselves, and Angie is working hard on discovering hers through all of this. Thanks to Lena North for the book in exchange for an honest review. Bitter Sweet Street is available for 99 cents on Kindle. 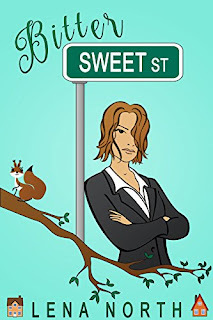 See Sara's review of 47 Sweet Street.